Isaac P. Christiancy was born in March of 1812, in Johnstown, New York. At 13 years of age, Christiancy taught school in order to support his family. He began his study of law in 1835. Christiancy moved to Monroe, Michigan, in 1836, where he assisted in settling the area by establishing a law practice. He practiced law in the area from 1838 until 1857, all the while maintaining a career as a public servant. He was Prosecuting Attorney for Monroe County from 1841 until 1846, and he served in the state Senate in 1849. At that time, slavery was a controversial issue throughout the nation. Due to Christiancy’s vehement opposition to slavery, he was instrumental in the formation of the Republican Party in Michigan. Christiancy also purchased and served as editor of the Monroe Commercial. 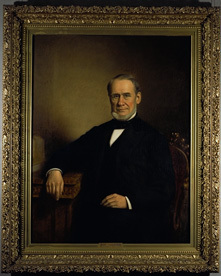 In 1857, Christiancy was elected to the newly reorganized Michigan Supreme Court. He was unanimously re-elected in 1865 by all parties. Christiancy resigned from the Court in 1875 to begin his duties in the U.S. Senate. While a member of the Senate, Christiancy took part in many national debates surrounding issues of Reconstruction. However, some personal troubles marred his reputation. While in Washington, D.C., Christiancy was the victim of the plot of a young lady. Having been a widower for some time, the young lady mistook a comment of his for a marriage proposal. Despite his protests, the young lady threatened to bring a suit for breach of promise against him. Rather than suffer that ordeal, Christiancy conceded and married her. The next few years proved to be miserable for him. Christiancy resigned from the Senate and President Rutherford B. Hayes appointed him Minister to Peru in 1879.